First of all we wanna extend our deepest sympathy and condolences to you and the bereaved family of Gwen. Gusto lang nako e-clear ang mga misinformation ug pamasangil sa news articles na naka panamaktamak sa pagkatao ni Eva Mae. Kaning sulat nagamatuod sa mga panghitabo to the best of my knowledge. Nagsugod ang among paghinigugmaay niadtong August 22, 2001, and since then we were so inseparable up until my family migrated to the US. 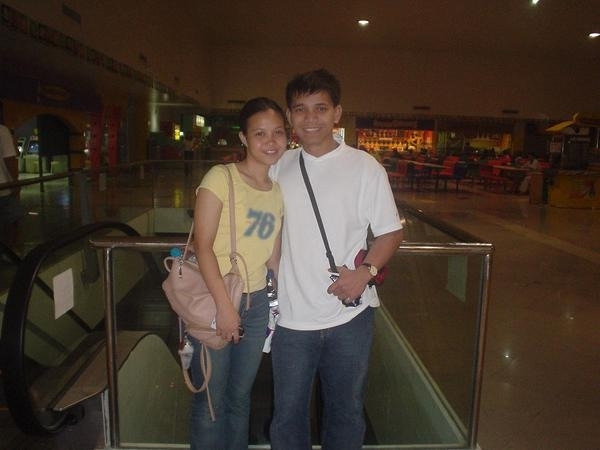 I had mixed feelings at that time, kamingaw ni Eva Mae ug kalipay kay nahibaw ko na masecure na ang among future as a couple, that we can make our dreams a reality. The distance didnâ€™t matter; our love grew even stronger with Godâ€™s blessings. We wanted to get married a few years back and after her graduation, but I wasnâ€™t a citizen yet and in my knowledge it takes longer years to petition the spouse of a green card holder and so we delayed it and moved it late this year since I am going to have my oath-taking to become a citizen this August of this year. But now the whole reason for my wanting to become a citizen is gone. It would then be meaningless. I came for a two weeks visit to the Philippines in 2004 and was very happy to be reunited and spend time with Eva Mae and my family. By that time my Mom has already stopped her decade of work as an OFW because we knew we can support her. I decided to buy a house for her and Grandma where they can live comfortably. However, the house was still not complete by the time Mom joined us here in 2005 so I wanted to give the property to Eva Mae right at that moment since I trust her so much. My family knew her for a long time and trusted her also. I thought with her name on the property it will be useful when she applies for a tourist visa so she can come and visit me once in a while, while I awaits my citizenship. Azienda Firenze was still in its early years of operation and for some reasons the titles of most properties including mine were not yet available at that time (unfortunately). In Eva Maeâ€™s opinion, on the other hand, it wasnâ€™t appropriate. She felt â€˜kaikogâ€™ sa akong pamilya to have her name on the title. I tried to convince her then to be the person to occupy the house once itâ€™s ready but she declined by telling me to let my family occupy it first, again out of â€˜kaikogâ€™. Thatâ€™s what I loved about her in the first place, sheâ€™d always think about others before herself. Since the accused (from hereon Richard is referred to as the accused, I find it hard to even speak or write his name) was the only immediate family I had in Cebu, I appointed them (with pay) to look over the ongoing building of the house. I liked the subdivision, it was having a great view and with security guards in every gate, it sure was a safe and secure place for families. The property was completed in April and to my surprise, they started moving in with their things. I felt sympathy for their daughter whom they claimed didnâ€™t want to go back to their old house where they were kicked out. I permitted them to occupy the house in June 2007 with certain conditions, which included good maintenance of it. I started furnishing it and installed facilities and high speed internet connection for a convenient means of communication between us and with Eva Mae. I was able to visit again in September of the same year. Nakit-an nako ang kanindot sa lugar compared sa uban, I most definitely wanted my loved ones to live there especially Eva Mae. I again asked her to move in so we can communicate very conveniently everyday through the internet and she agreed. During my whole stay, I have shown to everybody how important and special Eva Mae was to me and that she sure was deserving of it. I came back to US with the happiest heart, Iâ€™d call her and sheâ€™d tell me sheâ€™s doing OK there. However, I have noticed that sometimes when I call her I would chance upon her cleaning the house and Iâ€™d ask why sheâ€™s doing it? She said she doesnâ€™t have any problem with doing household chores. Then again it became more frequent and I asked whatâ€™s going on? She said itâ€™s OK, she just wanted for them to see how to keep the house clean hoping theyâ€™d learn from it and do the same. But that didnâ€™t happen. So I requested her to take some photos so they wouldnâ€™t be able to lie to my face. They were not only showing disrespect to Eva Mae but also to me, not remembering the conditions I laid before they enjoyed free board and lodging. Dili makamahay nako ang mga accused kay gibuhat namo ang tanan para pagsuporta nila. My Mom would send them allowances which sometimes would come from my pocket. Ako sila gitabangan sa panahon na nakadasmag sila ug kotse sa judge, my older sister Karen in their behalf asked for our help. She joined them in the house but it didnâ€™t take a long time when she decided to leave because of the same cleaning issue and she also couldnâ€™t get along well with his live-in partner, the one who would seem to envy Eva Mae so much and the same person who would fabricate stories just to get rid of Eva Maeâ€™s house help (Emely) that time. His live-in partner has no doubt controlled him for a long time; he surely has changed for years because of her. I sent the accused a lengthy email dated 05/03/08, suggesting not to use text messages when they can talk things over. He asked for an apology to Eva Mae but the live-in partner remained indifferent and refused to do work because of her pride. I got fed up and I decided then to sell the house; the realtor even went there to personally inform them that the house is already listed for sale. The accused asked me thru email to extend their stay for some time so they can find a place to transfer to. Two months has passed and they still continued with the same batasan. My Mom also got angry and then cut their allowance kay dili maminaw sultian. A day after that, the live-in partner left the house and did not come back for days and Eva Mae has sensed something might be wrong about the people (de los Reyes would now frequent the house) there so I requested her to immediately move out. They (with Gwen) have found a good place, an apartment in Pilit Mandaue, I have paid a security bond and one month for it, and they have cleaned it up and bought boxes to get ready for their moving out. I was happy that finally Gwen and Eva Mae will transfer. I proceeded also to give the accused final notice to vacate the house not knowing it could have ignited their anger and jealousy. The same day (Wednesday) we have tried to contact our friends to help sa paghakot sa mga butang nila, I guess they were busy coz no one returned the calls. So we have opted to schedule for a â€˜lipat bahayâ€™ service supposed to be on the 26th of July (Saturday). On Thursday, while I was chatting with both Eva Mae and my sister who was in Bukidnon, while we were still trying to contact my friends for help with moving things out Eva Mae told me that the live-in partner just called and sounded differently asking if the accused was there and she replied yes. The other accused (de los Reyes) in a few minutes came to eat with the accused as I was told. We continued chatting until Eva Mae stopped replying at around 3:15 P.M. Cebu time. I felt nervous coz eventhough she mentioned earlier that they would sleep in Mandaue that night, sheâ€™d always inform me when she leaves the house. I was in my office working at that time so I asked my sister to try to keep in touch with Eva Mae since I got so worried. I also asked to contact Grace, Eva Maeâ€™s sister to know if sheâ€™s aware of her whereabouts. I contacted my friend Julius Garcia and requested to have an immediate check on the house but he got stuck with his kids so he called the guard to check the house for him, he was told by the accused that they (Eva Mae and Gwen) have left earlier. But I was suspicious coz they have not yet informed me that they have gone to Mandaue. I called up Grace and asked if she knew the place in Mandaue aron makasiguro mi na tua sila didto and she replied "wala siya katuod", she calmed me down though by saying sheâ€™d be OK and will tell her that I called. I went home and took a couple of hrs sleep. I still didnâ€™t get any response till I went back to work; I felt a very odd sensation on my way to work like I would want to cry so hard. I spent most of the hrs on my shift trying to contact the best people I can find to help me check on them in the house. Roughly 25 hrs has passed without any communication with Eva Mae; I called the guards and forced them to break in the house, hoping theyâ€™d find Eva Mae and Gwen there. They refused to do so without prior authorization from the owner of the house, my sister Karen then contacted my friend Michelle who lives in the neighborhood to attest of my ownership of the house. So they broke in the house, at the same moment Grace and Josh arrived (I was on the phone with the guard), I felt a fleeting relief to hear their voices but again got worried when they saw Eva Maeâ€™s backpack still in the living room. Thatâ€™s the time I knew something is very wrong. I immediately requested Grace to report this to the police and to block the access of the accused to the house. I was still hopeful nothing worse has happened to them that they were just taken as hostage somewhere. I was so restless at that time until Grace called me and spilled the gruesome news in crying, I'd cried and passed out in my fatherâ€™s arms. Maayo gani kay abtik ang mga kapolisan ug nadakpan on the same day ang mga criminal. I strongly condemn their actions. Moangkon ko nga nagaplano ko na mo-retaliate sa mga accused to take vengeance for Eva Maeâ€™s and Gwenâ€™s brutal death but neither would it change anything nor will it make things better. Gipadako sab mi sa among mga ginikanan na mahadlokon sa Ginoo, and I cannot speak for him for his lack of it. Same blood may be running through our veins but still we are different individuals. Vengeance is not ours, itâ€™s Godâ€™s. People have advised me to leave everything in Godâ€™s hands, though it is painful and devastating, I guess I have no choice but to do so. I still find it hard to believe that sa kagamay lang na problema makabuhat ug ingadto ang usa ka taw labina kon kadtong tawhana igsoon ( dili na karon, Iâ€™ve cut whatever connection we have). Sakit kaayo sa akong side ug kahibaw ko na triple or labaw pa ang kasakit sa pamilya ni Eva Mae ug Gwen kay sila ang pirmirong nakakita sa lawas nila. Mura ra sad nilang gipatay ang among pamilya, ang among pamilya sa bisan asa na dapit na nakabalita sa nahitabo and they felt so terribly bad and they are looking forward na matagaan na ug hustisya ang ilang kamatayon ni Eva Mae ASAP, kulang pa gani ang ilang kinabuhi ibayad. My whole family was hoping for it to be just a terrible nightmare, but very sad to say it wasnâ€™t. We are united in praying na mahaluna na ang mga souls ni Eva Mae and Gwen. We had so much plans for the future ug maoy akong sincerest desire na makatabang ni Eva Mae ug accomplish sa iyang mga plano bisan wa na sya diri sa kalibotan. I know this is what she wanted aron mapahaluna na sya. She will always stay in my heart and her memories will live in me forever. Even though sheâ€™s gone, I can still feel her presence, I know sheâ€™s just here with us. I find this so difficult to write while mourning her demise coz it intensifies the pain I am feeling. I am hoping and praying that the hearts of those they have left behind will soften through their faith in God that He alone knows the purpose why this has to happen. May we all be guided.